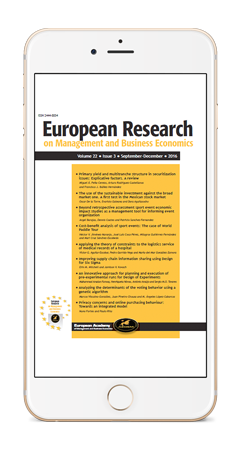 European Research on Management and Business Economics (ERMBE) is a journal published every four months (January, May and September) by European Academy of Management and Business Economics (AEDEM) since 1995. ERMBE uses a doubled blind peer-review system for all articles submitted. In order to guarantee the quality, interest and scientific accuracy of the articles published, ERMBE has a Scientific Committee and an Editorial Board, whose members actively collaborate in the selection and review of the articles submitted for consideration.